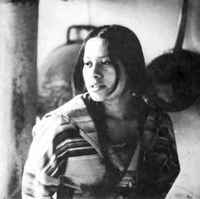 Born Mary Ellen Moore-Richard in 1954 on the Rosebud Indian Reservation, South Dakota, she was a member of the Sicangu Oyate, also known as the Burnt Thighs Nation or Brulé Band of Lakota. She was raised primarily by her grandparents while her mother studied in nursing school and was working. Brave Bird was the author of two memoirs, Lakota Woman (1990) and Ohitika Woman (1993). Richard Erdoes, a long-time friend, helped edit the books. Lakota Woman was published under the name Mary Crow Dog and won the 1991 American Book Award. It describes her life until 1977. Ohitika Woman continues her life story. Her books describe the conditions of the Lakota Indian and her experience growing up on the Rosebud Indian Reservation in South Dakota, as well Born Mary Ellen Moore-Richard in 1954 on the Rosebud Indian Reservation, South Dakota, she was a member of the Sicangu Oyate, also known as the Burnt Thighs Nation or Brulé Band of Lakota. She was raised primarily by her grandparents while her mother studied in nursing school and was working.